More than 100 prisoners escaped from a high-security prison in the eastern Ukrainian city of Donetsk after it was shelled, leaving at least one prisoner dead and another 18 injured, the city council’s website said Monday. DONETSK, August 11 (RIA Novosti) – More than 100 prisoners escaped from a high-security prison in the eastern Ukrainian city of Donetsk after it was shelled, leaving at least one prisoner dead and another 18 injured, the city council’s website said Monday. “Late in the evening of August 10, a shell hit the living quarters of the high security prison colony Number 124 in the Kirov region: one prisoner was killed, three received injuries and another 15 were slightly wounded,” the city council said. After the shelling, 106 prisoners escaped, but by morning some of them had returned, the council said. Artillery shelling resumed in the city of Donetsk early Monday, knocking out 214 electrical power substations near the Tochmash plant. Power to 200 of them was restored several hours later, but the remaining 14 substations still needed repairs. The situation in the city remains tense, according to the city council. Last week, shelling in Donetsk claimed the lives of four people and injured 18. 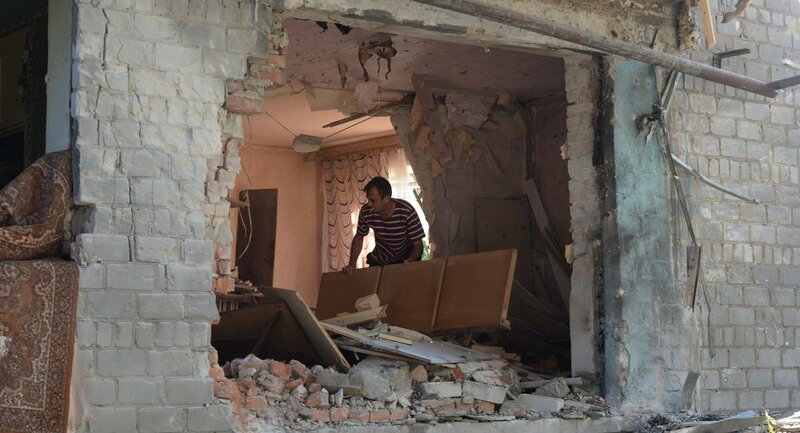 Ukrainian eastern cities have been the targets of attacks since mid-April after Ukrainian authorities launched a military operation to suppress a growing independence movement in the region. According to the United Nation’s latest report, more than 1,100 civilians have already died in the conflict and nearly 3,500 have been injured.